Dorney LakeOff Court Lane, Dorney, Windsor, SL4 6QP. 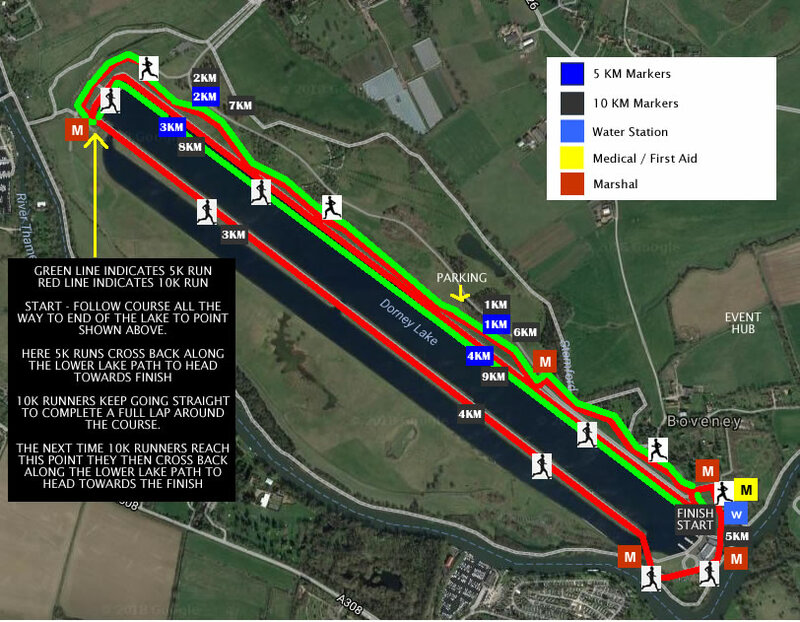 Join us for our Fix Addiction Summer 5k and 10k run set at the stunning Dorney Lake. Get together with friends, family or colleagues and join us for this great event at the stunning Dorney Lake. Make sure you read all the details below to ensure you are all set for race day! Registration will be open from 8am (you will see our Orange Gazebo before you get to the Clubhouse!) and will close at 9.10am. Race numbers and race chips will be collected on the morning of the event. You will receive a RACE CHIP. This will correspond with your race number. This is essential to record your time. Please make sure it is on before the start of the event and hand back to our team once you cross the finish line. The 10k will start at 9.20am and the 5k will start at 9.30am. Have fun! Whatever your level of running this event is suitable for all. It’s going to be a great day! There will be marshals around the course to support and encourage you. Please take care when running around the course as this is public land and local residents will be at the venue. Please always stay on the left unless otherwise guided. A dedicated bag storage area will be available next to the registration tent. Toilets and showers are available in the club house. Parking is located for all run entrants about half way down the lake towards the clubhouse and it’s about a 10-15 minute walk to the event hub from there. The Clubhouse has changing rooms, toilets and shower facilities. We have a dedicated storage for your belongings located next to the registration tent. There is a cafe in the Clubhouse where you can get drinks and snacks. Everyone will receive a medal and there will also be a number of prizes up for grabs. Drinks and refreshments will be available from the Clubhouse. Relax! Check out your results at our race timing van once you cross the finish line. Results will be up online within 48 hours of the event completion. The full address for the event is Dorney Rowing Lake, Dorney, Windsor, Berkshire, SL4 6QP. A link to the venue can be found at the top of this event page. If travelling by train the main stations for Dorney Lake are Slough (Paddington line) and Windsor & Eton Riverside (from Waterloo) but is also near Burnham, Taplow, Maidenhead and Windsor & Eton Central (branch of Paddington line). From these stations you can get a taxi or if with a bike you can ride to the venue. We recommend researching the best option before travelling to ensure you arrive on time. This is possible only if the event isn’t sold out. This will be stated on the website prior to the event. We email you your race number and details and this also goes on the website prior to the event so you can search if you haven’t received your email for any reason. You then collect your race packs at registration on the morning of the event. You will receive an email confirming your entry. If a friend or colleague has entered as long as they have used your email address in the entry you will receive confirmation. Yes we send out email updates prior to your event and you can view all event details, news and offers by logging in to your user profile. Yes all our events (unless otherwise stated) are chip timed! In most cases you will use our disposable race chips. You need to ensure you put these on correctly on your shoe (race instructions will be given via email and this info is on your event information page on your event page). Can I find the race number list prior to the event? Yes, your event race list will be online approximately a week prior to your event. Please make a note of your race number and that of friends as you will collect your race pack on the morning of the run. If you don’t receive your race email it may be because the wrong email address was inputted or the race email went in to your junk mail so please check carefully. All information will can be found by logging in to your user profile and your race number will show within this account area. Absolutely! Get as many friends, family or colleagues together and run as a team. You are not required to run together and each person will receive their own time however it's just fun to run under a team name. Yes this is typically ok for most locations however please check the run route course as some locations can be a mix of path, trail, grass so not always suitable for running with a buggy. Also please try and stay to the left as much as possible to give room for other runners. Can I volunteer to marshal at the event? Absolutely! If you miss out on a place or just want to help out on the day and marshal that would be great. You would be there to support and encourage all entrants. Contact us by filling the form to express your interest. We would welcome you to join our team. The Fix Events refund policy is: Up to 14 days before the event you can either (i) cancel and receive a 60% refund or (ii) transfer your registration to another Fix Event (£5 transfer fee applies). Alternatively, you can transfer your place to someone else you know who may wish to take part. To do so you must email info@thefixevents.com. Unfortunately, after that, we cannot give refunds or transfer your entry to another event. Entries close on the 10th July, 2019. Event prices exclude 10% booking fee. Off Court Lane, Dorney, Windsor, SL4 6QP. Event Merchandise - Get the look!